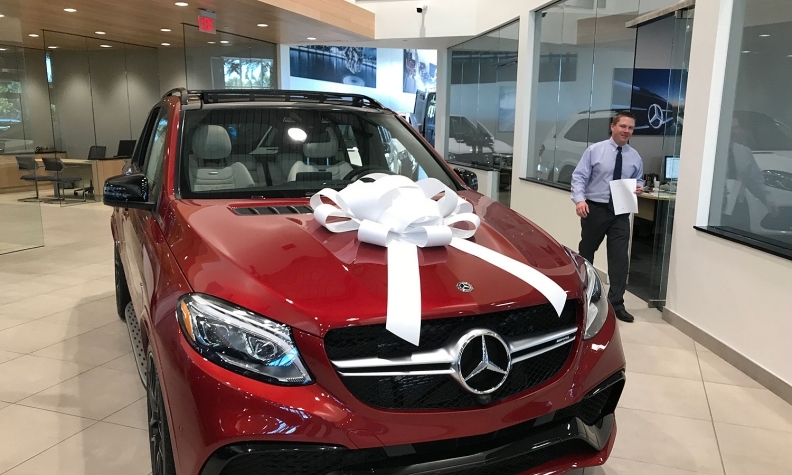 Mercedes-Benz tapped demand for SUVs to help it win the U.S. luxury sales race in 2017 despite a decline in its own sales. The victory gave the brand back-to-back titles as the luxury market declined for a second straight year. Coming in at No. 2 was BMW, which just beat out the previous year's runner-up, Lexus. Lexus finished 553 vehicles behind BMW after posting a 14 percent drop in December. Overall luxury sales for the year declined 0.2 percent to 2.02 million. That compares with a 1.8 percent decline overall for U.S. light-vehicle sales. Seven of the 13 luxury brands posted decreases in 2017. Like the overall vehicle market, the luxury segment suffered amid a precipitous drop in sedan demand. That falloff was countered by growth in luxury crossover and SUV sales. "The glaring difference is the way that Mercedes has been more successful in shifting mix to truck from car," said Kevin Tynan, a Bloomberg Intelligence analyst. "They've done a better job of getting a richer truck mix sooner than BMW has." "Lexus got off to a really rocky start in 2017," said Michelle Krebs, executive analyst for Autotrader. "Lexus had a terrible January that it blamed on low inventories." Audi's U.S. sales rose 7.8 percent in 2017 to a record 226,511 vehicles, propelled by the Q5 and Q7 crossovers, putting it in fourth place for the year. Cadillac, Acura, Infiniti and Lincoln took the next four places. In addition to Audi, other luxury brands posting gains for the year were Infiniti, Land Rover, Porsche, Jaguar and Genesis. Despite two years of decline, luxury-brand sales are still close to the record level set in 2015. Luxury automakers are poised to have another solid year in 2018, said Zohaib Rahim, research manager for Cox Automotive. "With strong stock market performance, decade high consumer confidence, and a robust labor market," Rahim said, "consumers looking to move up into luxury vehicles will have ample opportunities."